Pallets | McNEILLY WOOD PRODUCTS, INC.
McNeilly Wood Products Inc. is a full-service manufacturer of new and reconditioned pallets. McNeilly can create custom-designed pallets, or build pallets to standard specifications for particular industries. New pallets are assembled using high-speed nailers at a rate of 1,900 per eight-hour shift. Specialty pallets are assembled using pneumatic hand nailers. Specialty pallets are also manufactured in-house. Reconditioned pallets are processed in the pallet sorting and repair building. After sorting, pallets are placed at different repair stations, repaired, and then checked again. McNeilly handles 1.5 million incoming pallets per year. Remanufactured pallets are produced using dismantled parts from previously used pallets. They are then cut to specific sizes for re-use. 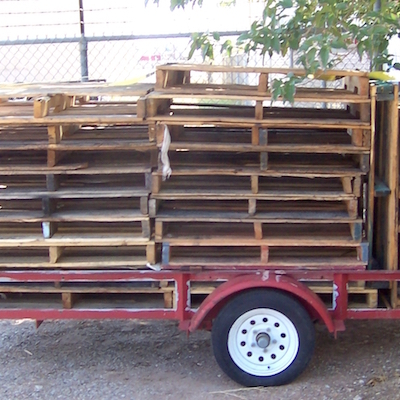 Pallets can also be reconditioned, remanufactured, or ground into mulch and wood chips.